The entrance to El Barco. 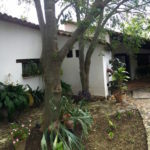 El Barco is our home in Oaxaca and our primary rental. We lived here for five years (2005 to 2010), come back often, and intend to retire here when that time comes. The house sleeps six (seven in a pinch). Find details and photos here. 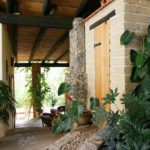 La Casita is the guest house. The living room is outside, but sheltered and cozy. It’s an amazing space that must be experience to understand. Guests love it, as do we. Find details and photos here.